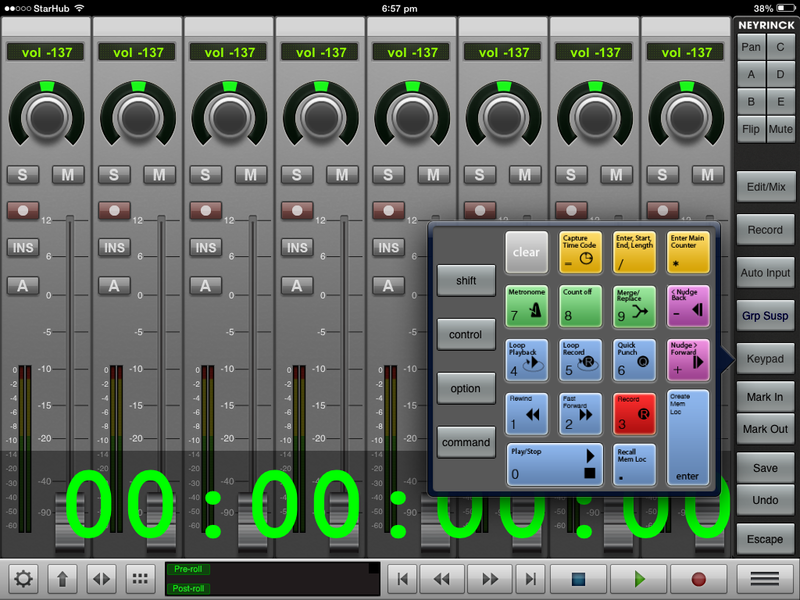 V-Control Pro is an iPad app made by Neyrinck which allows you to control your DAW via the numerous control available in V-Control Pro. V-Control Pro works with most DAWs thatare available including Pro Tools, Logic, Cubase, Digital Performer, Ableton Live, etc. You can check out the list of compatible apps on their website for more details. After purchasing and downloading it onto your iPad, you will be directed to download a helper app to install onto your workstation that links V-Control Pro on your iPad to your DAW. 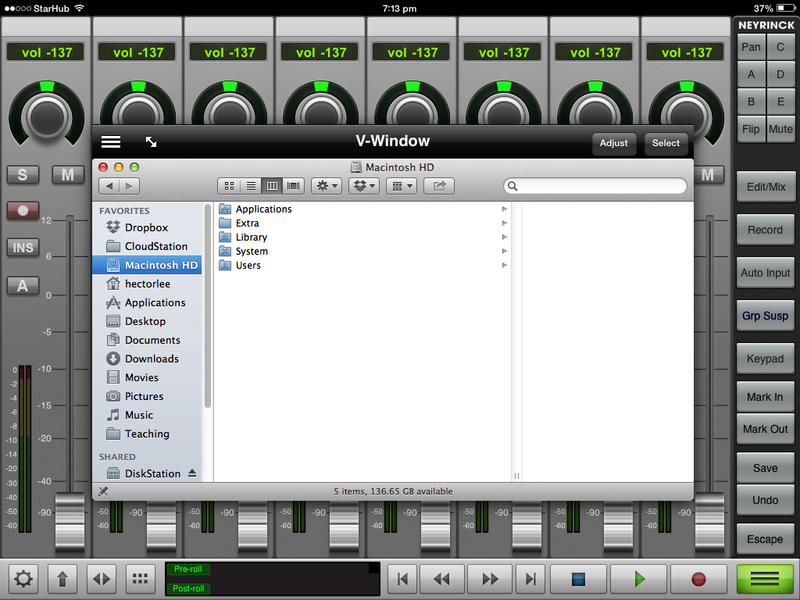 What this helper app seems to do is to create a virtual midi interface that bridges the V-Control Pro on the iPad and makes it appear as a HUI device connected to that virtual port. However, this helper app definitely does more than just that as we look deeper into the other features available in V-Control Pro. The primary layout of V-Control Pro is fairly straight forward. You are immediately presented with a mixer-like control surface with eight faders and control knobs. This is the primary interface for mixing with your DAW. 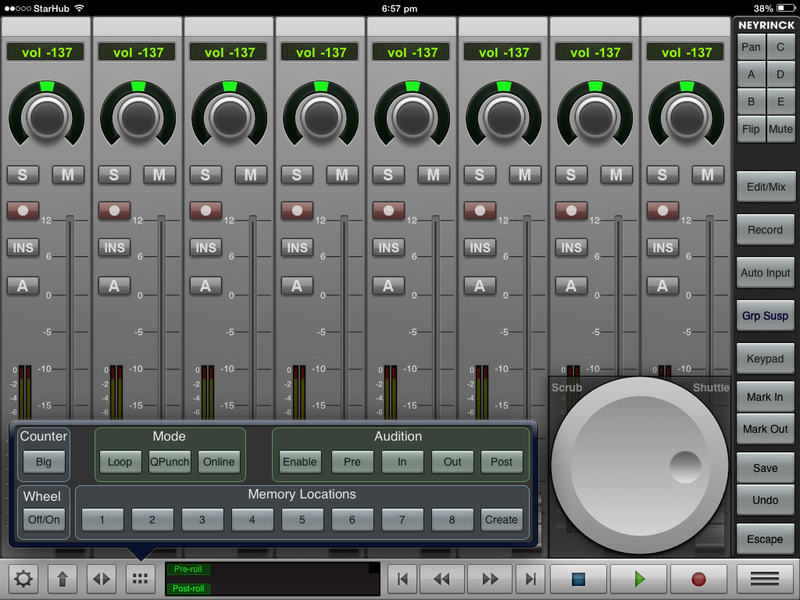 If you have used a mixing control surface before, you should find yourself at home. Transport controls are available at the bottom of the screen. Additional function keys are available on the right side and via menus button on the bottom toolbar. The touch interface is extremely useful as it can adapt to various interfaces. There are surround panners, scrub wheels, and lots of function buttons like memory locations, zoom, automation and group controls. This replaces the need to remember numerous keyboard commands or the use of the mouse. Im an advocate of memorising keyboard commands but there are some commands that are just not used frequent enough to commit to muscle memory. This is where the numerous function keys become really useful. One of the problems with working with touch screens is that you have to constantly look at it to know where to place your hands. The haptic feedback of placing your hands on physical faders and being able to close your eyes to listen while mixing is invaluable. 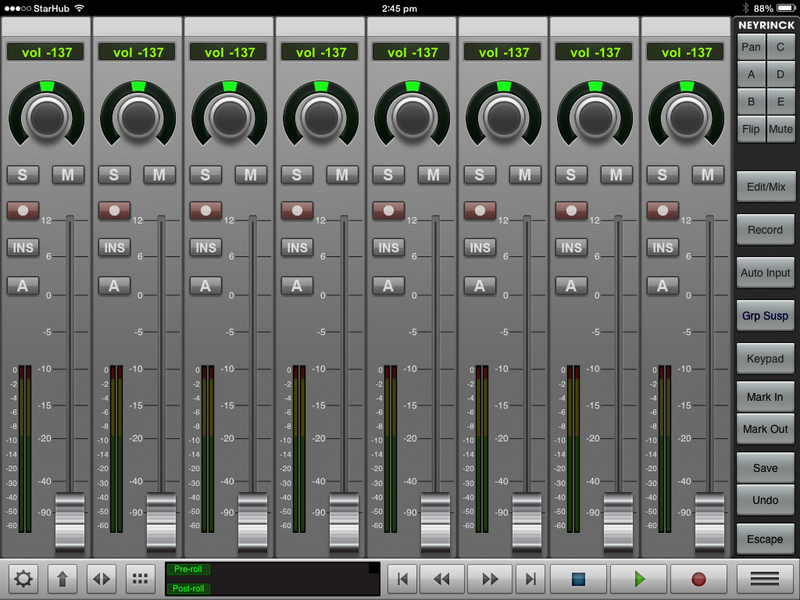 Being able to feel where the faders are relives the need to look and allows you to focus on listening. A somewhat important thing to do. Theres been a lot of talk about haptic feedback for touchscreens but until the day comes where they release one, physical controllers will always have a place. 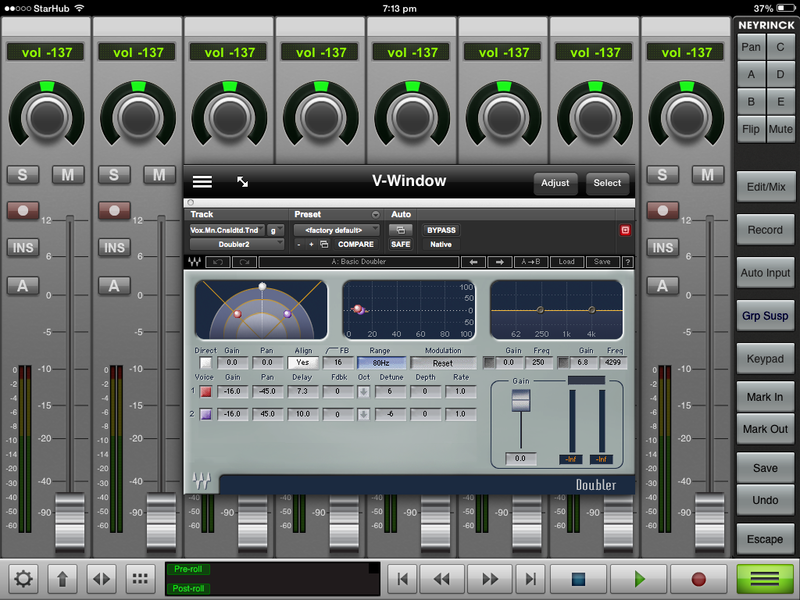 The biggest feature that sets V-Control Pro apart from the other HUI-emulation apps on the iPad is the V-Window. V-Window lets you bring up any open window on your computer and display it on the iPad. This could be plugin windows, an edit window, or even a window from another app. This second display is extremely useful as you can also interact with the display, tweaking the plugin with touch control. You could display your plugin using V-Window and place it in a more convenient position such as on your keyboard or on a music stand while playing a guitar. 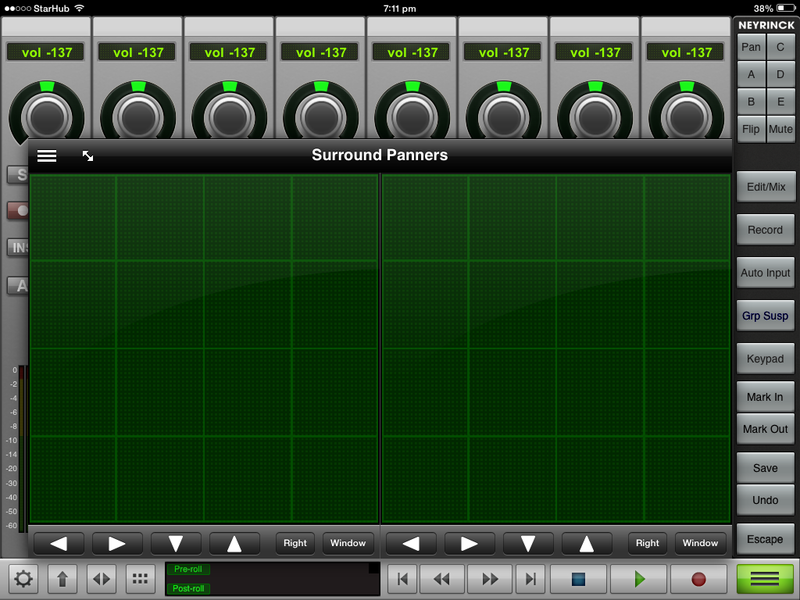 V-Control Pro isn't the cheapest iPad app but it definitely costs much less than an equivalent hardware controller. Even if you factor in the cost of an iPad, its probably still cheaper than something with a matching feature set. Ive been using it for a couple of weeks now and Ive found that its a useful tool that has its place in my studio. Although Im not always using the faders as a primary mix controller, Im really digging it for the wireless and function keys. Theres a lite version thats free to check out on your iPad and maybe you could consider adding it to your arsenal of studio tools.